Two weeks ago, I gave some recommendations for solid value bourbons. 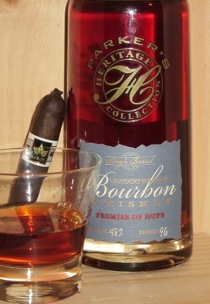 Parker’s Heritage Collection 2013 “Promise of Hope” is a bourbon that’s on the other end of the price spectrum. In fact, while each of the bourbons on my list cost less than $20, every bottle of Parker’s includes a $20 donation to the Parker Beam Promise of Hope Fund, a charity established through the ALS Association in honor of Heaven Hill Master Distiller Emeritus Parker Beam, who has recently been diagnosed with ALS (also known as Lou Gehrig’s Disease). So while the price might be high (around $90 a bottle), it’s worth knowing the revenue supports a good cause. The bourbon is a vibrant amber color. The nose features an inviting combination of fruit, clove, and baking spice. On the palate there’s more spice (clove, cinnamon, nutmeg), fruit (apple cider, dried cherries), and wood (dried oak and a hint of char). It’s perfectly balanced with a long finish that has plenty of sweetness and a hint of fresh corn. I’ve always been a big fan of Evan Williams Single Barrel Vintage bourbon, and there are similarities between the two Heaven Hill bourbons, although price isn’t one of them. In many respects, Promise of Hope is a more refined, more balanced, and more focused version of Evan Williams Single Barrel Vintage. On its own merits, it could be tough to justify the price (compared to Evan Williams Single Barrel), but the fact is these limited edition bourbons often get bought up and then resold at a premium on the secondary market. So I’d rather have the extra $20 go towards ALS research. As for cigars, you’re going to want a balanced, elegant cigar to appreciate everything Parker’s Heritage Collection 2013 “Promise of Hope” has to offer. Think Davidoff Nicaragua, Partagas Benji Menendez Masters Series, or the Cohiba Behike.